Service Experts of Charlotte HVAC Equipment Clearance Sale, Get it While it Lasts! If you’re like most Charlotte homeowners, you are always on the lookout for a special offer to help save some money! 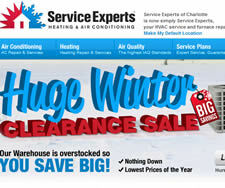 In this case, Service Experts of Charlotte (info and reviews) is having a season ending clearance sale of some of the heating and air equipment they have left in their inventory. It’s a great chance to save money on a new system before the 2012 air conditioning season reaches the Charlotte area. It’s actually a heck of bargain they have on the winter clearance sale promotion. Not only do you have the opportunity to save big money on the heating and air conditioners, they will also give you a $50 Service Experts gift card, just for getting the estimate! It’s your final chance to take advantage of our lowest prices of the year on new furnaces and air conditioners. We are always on the lookout for more way to save on HVAC costs in Charlotte and this latest sale by service experts, which ends on Feb 29th, is a great addition to our Charlotte HVAC Coupons page.